Groundbait is put into a swim to attract and hold fish and is very useful, if not essential, in producing results in most kinds of coarse fishing. Made-up groundbaits range from heavy mixtures, which sink to the bottom rapidly in a fast current, to ‘cloudbait’, which make the water attractive to fish and are used in slow currents or Stillwater. More simply, groundbait can be samples of the hookbait thrown in loose-worms, maggots, casters, hemp, and others, or combinations of these, are commonly used. Bags of dry groundbait, mixed and ready for use, can be bought from tackle dealers but, unless one buys in bulk, it is generally cheaper to mix your own. You can then make up groundbait to suit differing water conditions and your own personal preferences. The basis of most groundbait mixtures is stale bread, prepared by breaking it up or mincing and then soaking it in water for an hour or two, or overnight if very hard. When soaked, drain it as much as possible and make into a smooth paste. This can be made into small balls for throwing into the swim. Numerous ingredients can be added to the basic mix and their use is to some extent determined by the type of fish sought and the water conditions. For example, bran, semolina, chicken meal, sausage rusk, barley meal, boiled and mashed potato, clay, peat, crushed egg shells, samples of the hookbait, and other additives are used. These substances are especially useful in extremely fast water and when hook-bait samples are needed on the bottom. The extra weight takes the ground-bait to the bottom before it is washed away. small balls for throwing into the area to be fished. As they sink slowly these will break up and cloud the water. This effect can be heightened by using milk instead of water. The addition of semolina will improve the mix when wet and bind it for lobbing into a distant swim. It is well worth experimenting with both flavouring and colouring for groundbaits. Some fishes find added honey, for example, very attractive. Flavour can be introduced in the form of oils of aniseed, lavender, fennel, verbena, pilchard and others. Powdered egg and milk are also useful. Other additives will enhance both flavour and colour. Among these are blancmange and custard powder, flour, sausage rusk, crushed biscuits and hempseed. Fishing can sometimes be improved by colouring the groundbait to contrast with the hookbait. ‘Maggot pies’, probably first used by Norfolk anglers for ground-baiting a swim when ledgering, are based on a cloudbait mixture (either bought or made up), which is poured into a large flat vessel at the water’s edge and wetted to the required consistency. Feeder maggots are then added and orange-sized balls are made and thrown into the swim. If expense is no trouble, the mix can be made heavier for fast flowing water by the addition of boiled mashed potatoes. 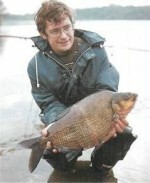 In general, about 1lb of potatoes is used to 4lb of cloudbait. For a long day’s fishing, or a big match, make about 10lb of the groundbait and add a half a gallon of feeder maggots. For very fast water it may be necessary to add clay or even pebbles. ‘Black Magic’ is the name given to a dark groundbait. It is prepared by working in a proportion of lawn peat to the bread. The peat should be dried and sieved finely before mixing, and the final groundbait mixture should be dampened at the water’s edge as needed. A liquid groundbait, unusual yet sometimes effective when fishing lake margins with floating crust for carp, can be made from well soaked bread mashed and mixed with water or milk. This is dilute enough to simply pour into the water. Trout pellets, which are used to feed and fatten fishery bred trout, are rich in protein and send trout into a frenzy at feeding time! Most fish will take the pellets, but crushed and mixed with breadcrumbs they make an excellent high protein groundbait that has been successful with carp and tench. Luncheon meat is a highly successful hookbait for chub and barbel, and groundbait for use with it should contain meat. Sausage meat works well enough, but minced meat is better. Either can be used on its own or added to an ordinary groundbait. Most anglers bait only one area from any one bank position. But baiting two separate areas, one close in and one far out, is an interesting and effective method of hedging your bets when fishing larger waters. For much of the season, roach and dace shoals occupy the margins alongside the shelf, but bream are to be found far out in the deep middle section. By double groundbaiting, you go after either roach and dace or bream, whichever produces the best bites. For a session starting early in the morning, a sensible plan would be to rig up both ledger and float rods, but first to ledger the middle for bream over a groundbait carpet of cereal and hookbaits. At the same time the near swim, just two rod lengths out, should be loose fed with casters. After an hour or so, if the bream prove uncooperative, you could then switch to the float rod and trot down for roach or dace. You would now be fishing a swim which had been regularly fed without any distur-bance – something which gives a shoal confidence. Moreover, a swim which has been fed slowly will often produce fish for much longer.